Memory Hacking Software • View topic - Any updates so far ?? Hey guys.. i think there's still a Black Charms ( working as of 27 Nov 2009 ) cause i asked this 1 guy he said there is bt then when i asked him more info .. he jus blocked me off Wolf Messenger.. so yeah i think there is..
Wat do u guys think ? Is wolfteam 100 % clean now ?? Re: Any updates so far ?? arsenal wrote: Is wolfteam 100 % clean now ?? There will be always hackers of Sean or b6ooy. 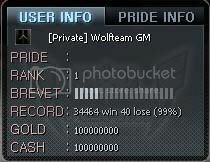 sean and b6oooy hack make wolfteam more more and more balance..
are u guys hackin nw ??? Jz4Funz u said it balance because you didnt meet any hackers?